It’s the final month of the year, and it’s time for a brand new month of pin releases. This month sees a fantastic mix of pins, so without further or do, here are December’s releases. Saturday 7th December sees a huge day of releases, with the Christmas 2013 lanyard (that has actually been available in the resort for some weeks now). A Violetta pin, which is a Disney Channel television show – This one looks a tad plain but should satisfy fans of the show. Next up, is a pin I’m incredibly excited about – the Attraction series has returned! I’m not so much of a fan of this one, but it’s still a must have as far as I’m concerned. A Paris Mickey pin which looks a lot like the Signature collection logo for the 20th Anniversary. Finally, the final seasons of 2013 pin for Winter seeing Sneezy with a snowman. I have all the Season pins so far for 2013, and I’d love to add this to my collection. 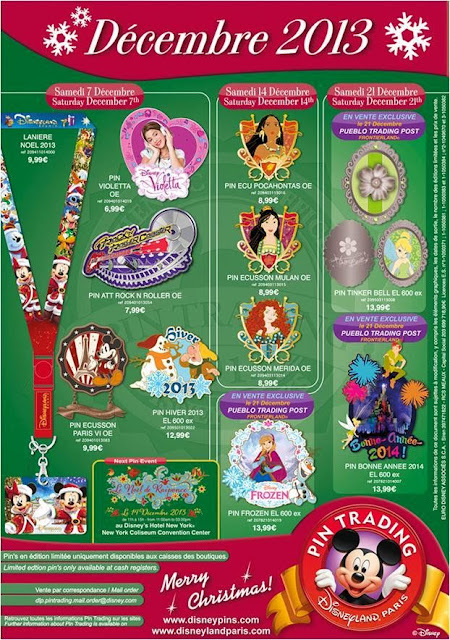 Saturday 14th December sees 3 princess carriage pins, featuring Merida, Mulan and Pocohontas. These are nice looking pins which will make princess fans happy. Again. Finally, Saturday 21st December sees a big limited edition pin release. The final princess locket in the series (that began back in January) will be released featuring Tinkerbell (not that she is actually a princess). The Bonne Année pin looks simply amazing, it’s very Dreams-esque. I will need to find a way to add this to my collection. Finally, a Frozen pin depicting Anna and Olaf, which is sure to sell out incredibly fast. A good month of pin releases, with the return of the attraction pins, as well as the final season and Happy New Year pin.